This Web Site is made available to the user ("User"), subject to the conditions that he/she accepts, without any amendment the terms, conditions and notifications contained therein. From the moment of access and use by the User of the Web Site, it is automatically considered that the User, has agreed with all the terms, conditions and notices, as defined below. 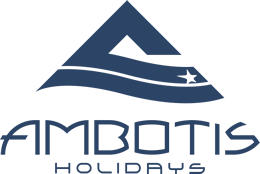 Ambotis Holidays reserves the right to amend or revise freely the terms and conditions of use are defined herein, at any time they deem necessary. For the purposes of timely notification of the Users Ambotis upon amendment of the terms will proceed promptly and immediately to publication of the new conditions and to the notification of the amendments done on this website. In any case it is clarified, that no such amendments are applicable to already concluded (before the amendment of terms) contract. The company Ambotis bears responsibility in relation to the accuracy, authenticity and completeness of the information listed in site regarding the identity of Ambotis. Ambotis is not responsible and is not bounded by electronic data entries made by error / mistake in the common experience and shall be entitled to correct these whenever perceive their existence. Ambotis is not under any liability for any loss or damage arising from the use or inability to use the information reported to the website. The said limitation of liabilities of Ambotis herein, is valid even in the case when the company staff or any other employee of Ambotis was informed on the possibility of occurrence of damage. The entire contents of the site, including the commercial names, trademarks, images, graphics, photographs, drawings, texts etc. is the intellectual property of Ambotis and is protected by the relevant provisions of Greek law, European law and international conventions of intellectual property of the third party, for which Ambotis have been granted the permit for its own exclusive needs. It is prohibited any copying, transfer or creation of derivative works based on such content or misleading of the public in regards to the real provider of the website. Any reproduction, republication, downloading, announcement or publicity or transmission or any other use of the content in any way or means for commercial or other purposes is permitted only with a prior written consent of Ambotis or any other holder of the copyright. The names, images, logos and trademarks which present and describe the website with commercial brand Ambotis as well as the other listed and displayed on the website commercial brands of the third businesses or products or services of Ambotis or other third party, constitute assets of Ambotis or of the third party, are respectively protected by applicable trademark laws. Their use in the on-line shop does not provide any permit or right of use by the third parties. The links contained on this website are linked either to the pages of Ambotis, either to the websites and web pages maintained by the third parties. These associated websites are not under the control of Ambotis and we are not responsible for the contents of any such site or any link contained in an associated web page or for any changes or updates to such sites. Ambotis is not responsible for emissions of the Internet or any form of transmission received from any linked site. Ambotis provide these links on their website, only for information, their use is not mandatory for the User and the fact that they are referred to the on-line shop does not suggest that Ambotis approves or accepts their contents.